For search engines, links have at least two functions. Links are a signal of relevance and links are a signal of authority (which includes a lack of authority, too!). Outlinks (links that point to a page on another site) can indicate what a web page is about. If a web page links to sites about green widgets then it could be a signal that the page is about widgets or about green widgets. It’s generally regarded as a good SEO practice to link to high quality websites, typically to a relevant .edu web page. This is good for users and helps search engines know what a web page is about. But there’s a problem. This technique was created around 2001 in response to search ranking algorithms developed in 1997. If the search engines have developed more sophisticated link and content analysis strategies, is it worthwhile to continue a practice that was designed to help a site rank for an algorithm that no longer exists? More importantly, if only SEOs are using this technique, is it possible that what was once a good SEO practice is now a signal of a low quality site that is trying to influence the search engines? In 1997 a researcher named Jon M. Kleinberg theorized that hyperlinks could be used to discover topic authorities and authoritative hubs, Authoritative Sources in a Hyperlinked Environment, which led to an algorithm called HITS (a synopsis can be found here). HITS is an algorithm that introduced the notion of authority scores and hub scores. Hub scores were concerned with outbound links to high quality sites. A site that tended to link to high quality sites would be assigned a higher hub score. A site that accumulated links from many hubs were termed authority sites. This 1997 algorithm is the source of the concept of outbound links being useful for ranking. This is where it all started way back in 1997. But is it useful to try rank a site with one foot in the present and the other foot in 1997? “It just made sense that Google was going to use every metric it could. I believe outbound links say just as much about a site as inbound links. 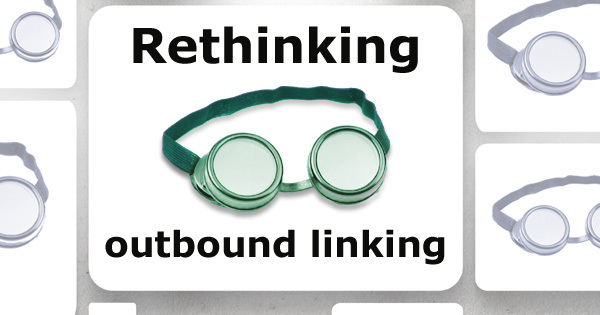 Outbound links are often more topical than inbound links. Clearly, outbound links are more important today, going far beyond the simple hubs and authority scenario of 1997. The above link analysis factors are just a few of the many ways a search engine can analyze a web page to determine if it is relevant and authoritative. Of importance is that calculating the ratios of normal linking patterns allows search engines to easily identify natural outbound linking practices. What this means is that if SEOs are linking out with a specific pattern that diverges from the patterns set by “normal” sites then the SEO linking patterns stand out, making them easy to identify. This is the reason why search engines identify and graph the ratios of inlinks per page, outlinks per page, etc., to identify sites that are natural and sites that are trying to influence the search rankings. There is a gray area between optimizing a page to be easily understood by a search engine and optimizing the same page to rank for a keyword query. Outbound links are just one signal out of many but it’s vital to understand it and do it right. Here’s an example of a site I know that did something great with their outbound links to rank for city and state related keywords. Instead of building a cookie cutter “State + Keyword phrase” pages they created pages that had phone numbers, addresses, names and useful outbound links to various agencies, both private and governmental that offered assistance. What’s key about those outbound links is they had a context beyond SEO that made them useful. I’m not naive, it was an SEO strategy. But it was a strategy predicated on the question any site visitor asks: “What’s in it for me?” By focusing on what you can do to satisfy the “What’s In It For Me” question you will be able to identify a solution that is better than simply adding outbound links to two authority pages. By refocusing away from rote SEO practices, some of which are outdated, you become more open to creating pages that will make it easier to earn links, rank better and along the way increase the metric that really counts, earnings.